Soweto Care System is web-based software for Non-Profit Organisations. Organisations providing home based care and HIV/AIDS counselling and testing, servicing orphans & vulnerable children and other beneficiary-oriented service providers are experiencing the advantages of working with an application with just about all the functionality they need. Using Soweto Care System Non-Profit Organisations benefit from a more precise and adequate administration and daily operation. This enables them to establish professional growth and development, resulting in offering more beneficiaries better services. Soweto Care System was developed with open source technology, free of license fees. The application is best accessed through browsers Google Chrome (recommended), Mozilla Firefox or Microsoft Internet Explorer version 9 and up. Bio data, people living in the house, housing conditions, family relationships, guardian information, household income, outstanding & acquired needs, financial status, health conditions, immunisation history, school information, clothing sizes and beneficiary contact history. Bio data, leave and sick days, work and training history, next of kin, bank and stipend information and SCS authorization level. Register per NPO program/donor, beneficiary program participation, attendance registers and history of beneficiaries in the program. Soweto Care System is designed for use on PC and laptop and mobile devices. With a new user interface for smartphone users, field workers have all the information they need to support them in their role directly at hand. With both data and Soweto Care System in the cloud providing support, releasing new software features and access to Soweto Care System have been greatly improved. It also allows the Soweto Care System support organisation to quickly communicate with all Soweto Care System users about system availability and scheduled maintenance. All reports and lists can be made suitable and will be available in Excel, PDF and hardcopy file. 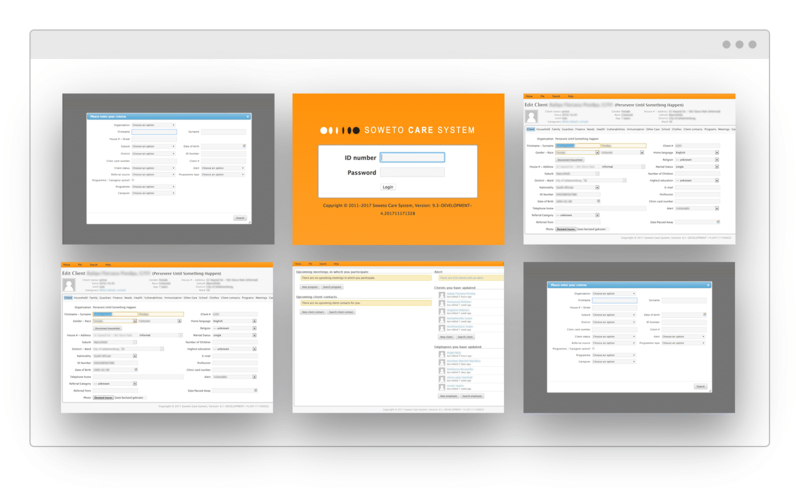 Soweto Care System allows for application of various authorization levels: ‘Administrator’ for full access, ‘Data capturer’ and ‘HRM’ for access to all beneficiaries or all employees respectively, ‘Caregiver’ for limited access to only those beneficiaries one is ‘caregiver’ for and ‘Read only’ and ‘Statistics only’ for limited access for e.g. sponsors or head office employees. Soweto Care System allows for a hierarchical organisational set-up. Under a ‘head office’, ‘provincial’ or ‘district’ offices can be set up with at the lowest level organisations where beneficiaries are actually being captured. The higher level allows access and instant online consolidation reports of all underlying organisations. The number of levels or organisations is unlimited. Organisations at the bottom level do not have access to data other than their own. Since the start in 2007 VX Company (a Dutch IT solutions provider) has continuously supported Soweto Care System by funding development of additional functionality and providing support. VX Company is a privately owned award winning Dutch IT system integrator which a unique and successful business philosophy (www.vxcompany.com). As part of their Corporate Social Responsibility project VX Company has given a life-time commitment for the support, maintenance and further development of the Soweto Care System software.